Jiangli is currently leading a diversified Analytical Chemistry group with multiple technologies including NMR, MS and HPLC to support Pfizer Chemistry teams in the eastern coast of USA. She has about 15 years industrial experience in biophysics and analytical chemistry with demonstrated expertise in structure characterization of organic compounds, natural products, metabolites, proteins and protein-ligand, protein-protein, and protein-antibody interactions using NMR and other technologies. She pioneered the use of residual dipolar coupling (RDC) to determine the solution conformations of small molecules and continues to work on the application of RDC to facilitate drug design of small molecules and peptides. Recently, there has been intense interest in peptides as therapeutic candidates due to their wide involvement in physiological processes. The characterization of peptide solution conformations is proven to be critical to gain insight into their activity, permeability, metabolic stability, clearance and bioavailability. 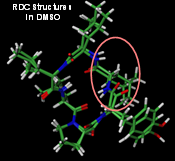 Here we report the technology development and application of RDC in determination of solution structures of peptides in different organic solvents.